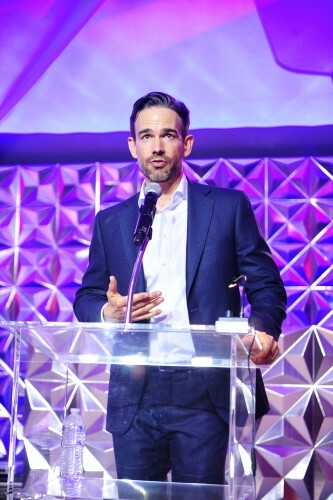 The Orthopedic Institute for Children (OIC) with the help of actress Debby Ryan, and actor Christopher Gorham as Master of Ceremonies celebrated a magical night in the clouds with guest honoring the immense impact of OIC’s pediatric orthopedics on children globally. OIC’s Annual Stand for Kids Gala honored Harry McKellop, Ph.D with a Lifetime Achievement Award for his prolific work. Over the past three decade he’s been a remarkable teacher and mentor to countless orthopedic fellows, residents, and volunteer student workers who have spent time working in his labs. His work has also resulted in novel methods to reduce polyethylene wear in orthopedic implants, which has helped improve the lives 12 patients to date. The night also honored the Automobile Club of Southern California with the Corporate Pinnacle Award. The Automobile Club of Southern California has been a long-time supporter OIC and the children they help for 40 years. UCLA Health was also honored with the Power of Partnership Award in honor of their 20-year anniversary of the alliance between UCLA and OIC. The unique partnership between UCLA and OIC has developed a platform for unparalleled contributions to patient care and scientific discovery in orthopedic surgery and musculoskeletal medicine. Debby Ryan, and Christopher Gorham kept the night filled with laughter and good times. While Tony, Emmy, and Golden Globe nominated star Matthew Morrison served as the night’s headline performer. His performance lit the stage and awed the crowed for a truly magical evening for a great cause.